On the weekend we were sent a hamper from Serenata Flowers; for those who haven't heard of Serenata Flowers they are a company that specialises in luxury food and flower deliveries; including food and wine hampers, flower bouquets, potted plants and a selection of luxury chocolates. Our hamper (we said, "surprise us!" because they have such a great selection and we couldn't decide - everything looked too delicious!) was a luxury cheese and crackers basket. Inside we had three types of cheese (Cropwell Bishop's Finest Blue Stilton, some Godminster Vintage Organic Cheddar and some Croome Cuisine Black Berries and Apple Mature cheddar), a jar of Kay's Kitchen's handmade Organic Tomato and Onion Chutney and a box of Godminster Rosemary Water Biscuits. Now you know what we're like; someone sends us food, we have to eat it! 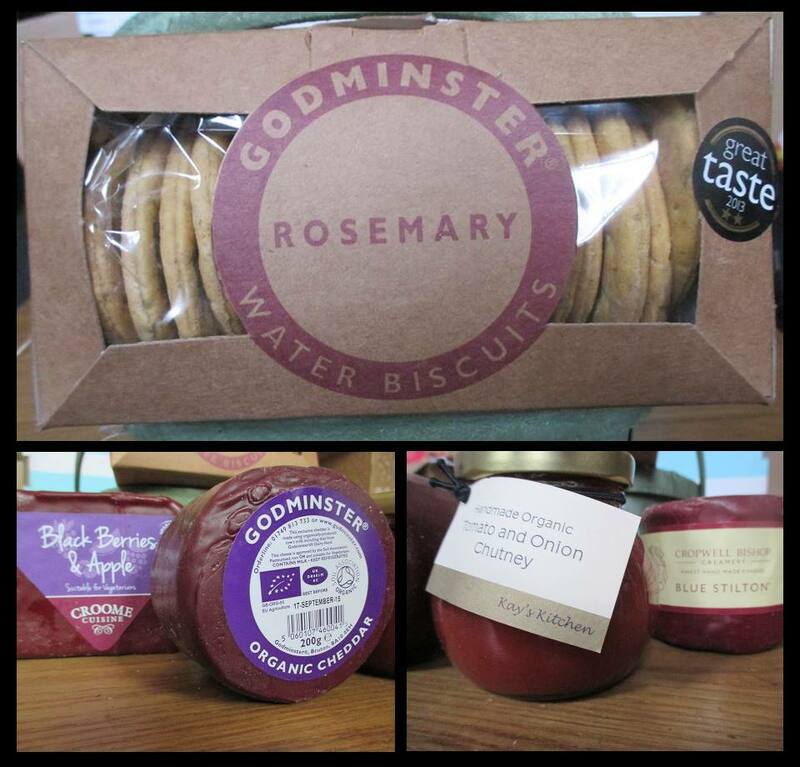 We had a few water biscuits, sliced off some of the Black Berries and Apple Cheddar and got out the chutney. Obviously it tasted delicious! You'd expect that. But you could tell that these were much higher quality than the sort of thing you'd pick up at the local supermarket. The water biscuits were light and the taste of Rosemary running through them was inspired, the cheese was beautiful - and the fruit gave it a certain je ne sais quoi, which really complemented the sharpness of the cheese. The Onion and Tomato Chutney though was awesome! We loved it! I'd be tempted to say it could double up as a salsa dip as it had a warmth to it which was pleasant and not overpowering; not to mention the fact that it was full of flavour and went well with the cheese and biscuits. The rest of the cheeses look equally high quality and we're expecting to be just as wowed by them. 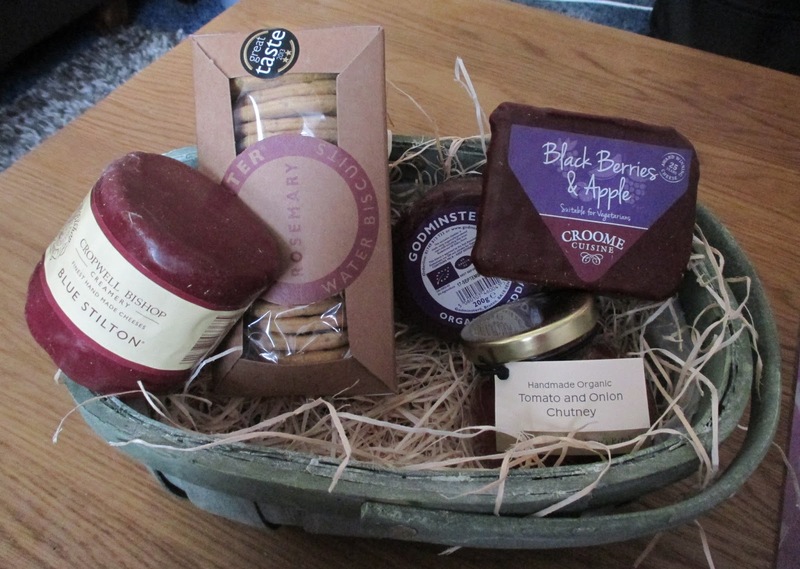 Our Cheese Trug hamper retails at £39.99 (which includes free delivery) and we think is a great luxury selection to spoil a cheese lover in your life. Serenata Flowers have kindly given me a £40 voucher to give away to one lucky reader of my blog. You can spend it on anything on their website - be it a hamper, chocolate, flowers or plants. Disclaimer: This cheese trug hamper was sent to me for the purposes of this post. All opinions are my own. I would like the Time for tea hamper. Aaaah, they are all great aren't they. My first choice would be the Tea Hamper though. All very useful items included, and a great gift. Oooh I can't decide between red wine or cheese - I love both! I do love some flowers though, I always need some in the house! The Chocolate Hamper for me! I'd definitely choose the Sweet Dreams hamper! It looks full of deliciousness!! Best of British Cheese! Oh yes! The chocolate hamper looks fab! I think it would have to be the chocolate hamper for my chocoholic hubby. The chocolate hamper - yum! Oh, choices, choices. I think that I would go for the Heavenly Chocolate Gift Box. Chocolate or tea...? Hmmmmm, tough choice! Sweet Dreams Hamper looks amazing! This one, I love cheese or the Huge bunch of pink lilies as they're my fave! The sweet dreams hamper is great! The Time for Tea hamper is fantastic! I would choose The Chocolate Hamper to treat my mum for her birthday. I think I would treat my Dad and get him the "Turn Up The Heat" hamper. :) Rarely complains about anything, so deserves a treat. Thanks for the chance. I'd get the Aztec Sun bouquet - love the colours! I would treat my dad with the Beers of the world hamper to say thanks for helping me cut the hedges! Beers of The World sounds good to me ! Cheers ! I'd buy a lovely hamper for my mum! Not sure which one yet - as there's too many to choose from! If possible, I would get the Divine Decadence Hamper. Love the look of the chocolate hamper. The Pamper Her Perfect Hamper is lovely. Wine, chocolate, cheese... not sure. Probably wine wins. I'd go for the Bordeaux and Artisan Cheese Selection hamper. I love the chocolate hamper - I'm definitely a bit of a chocoholic! Got to be the chocolate hamper, treat time! I love the Strawberry Sundae bouquet.. Amazing price and if I won I could order two! chese hamper for my granma! I would choose Beers of The World for my Partners Birthday. I like the tea time trug. I would send my mum the Kaleidoscope bouquet. Red Wine is just up our street. The Lush Lillies look beautiful! The Chocolate Hamper would be great. The Sweet Dreams hamper looks like heaven! Currently pregnant so no booze for me! Would love to win the cheese hamper. Delicious! I would probably go for the chocolate hamper but also like the look of the sweet dreams one. it has to be the chocolate hamper! Beer hamper for my husband. The Time for Tea Trug. The Chocolate hamper would be my choice. I'd go for the Divine Decadence hamper. Perfect to take outside in the summer. Red wine hamper, just for me.. The chocolate hamper would be nice.